As Pokémon Sun & Moon is set in a brand new region, there are a number of brand new characters that have significant roles in the game. 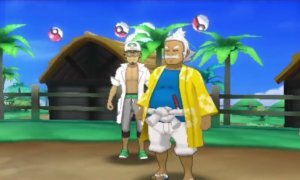 Professor Kukui is the professor on Melemele Island and helps guide you through the various parts of the game. His area of study is on Pokémon moves to the point that he has even taken hits from Pokémon moves at times when it has furthered his research. Lillie is Professor Kukui's assistant and is the same age as the player character. Despite assisting Professor Kukui in the study of Pokémon moves, she is not fond of making Pokémon battle, but enjoys reading. It was revealed in the Treehouse Live stream that Lillie has something living in her bag.